A smartly planned Taxation can create enormous wealth for an individual , without putting anything extra - the core pillar of Tax Planning is investments under various Tax Saving options, like- NSC, PPF, ELSS etc. By law, an individual can save upto Rs 1.20 lacs from being taxed, by way of investing in authorised products with 3 to 10 years lock-in. Besides this one can save extra out of his/her housing loan payouts. 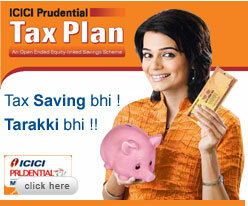 In other words, you can create a good amount of asset by way of investing in Tax Saving products on regular basis. Do check our ‘Recc Product ‘ section to see our offerings and suggestions in this regard.